With Pinterest's soaring traffic, entrepreneurs might find it difficult to resist tapping into the social media site's audience of potential customers. But how can you make Pinterest work for your business? 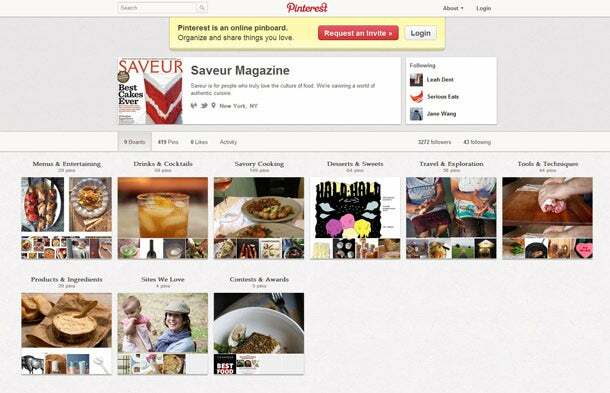 Among the many users on Pinterest, magazine publishers boast some of the most vibrant boards and engaged users. "Pinterest, whose primary audience at the moment appears to be younger women with interests in fashion, home, health and food, is a perfect platform for magazines whose stock in trade is spectacular photos and quality service journalism," says Cristina Dinozo, director of communications for MPA, the Association of Magazine Media. While not all businesses are as inherently visual as some magazines, many publishers are going beyond simply posting images to engage their fellow "pinners." Here, managers from three magazines discuss their top strategies for using Pinterest and how you can do the same. Post images that best tell your story. Believe it or not, Bonnier Corp.'s food magazine Saveur doesn't necessarily post its most amazing images to Pinterest. For longer feature stories that have many photos, editors will pin the image that "best encapsulates the story as a whole," says Saveur.com senior editor Helen Rosner. "In a piece about Malaysian cooking, for instance, the most objectively beautiful image might be a close-up shot of some ginger root on a cutting board, but stripped of its context, that picture doesn't tell the right story," she says. Instead, Rosner and her team might pin an overhead shot of a table laid out with beautiful dishes. "It's all about an image that tells a story in and of itself," she says. That strategy can be especially important when followers re-pin an image and change the caption. The picture should be able to stand alone without the context of the business's board. "Even better if [the images you post] can convey your mission or message even once they've been re-pinned," Rosner says. With 17 pin boards, Time Inc.'s Health magazine shares its wealth of information with its followers on Pinterest. But in February, the magazine jumped on an opportunity to cross-pollinate its Pinterest content with other social networks such as Facebook and Twitter. The magazine enlisted March cover model and personal trainer Jillian Michaels to create her own Health-branded pin board. It featured her personal photos, as well as items curated from the pages of the March issue. The board went live February 24, the same day the March issue hit newsstands. Simultaneously, Health hosted a 45-minute chat with Michaels on its Facebook page and cross-promoted it, along with the Pinterest board, on Twitter. 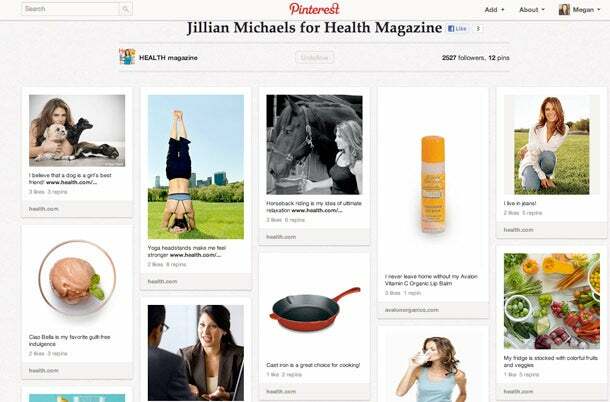 Health magazine's pin board with personal trainer Jillian Michaels. The goal of the multipronged strategy was to "continue the conversation" across its social media sites and to drive more traffic to Health.com, according to Tina Imm, general manager of Time Inc.'s lifestyle digital group. The plan paid off. Traffic from Pinterest was up nearly 70 percent in February, Imm says, and it has become the magazine's second biggest traffic referral source among social media sites. Engage users with a contest. Great photos can get people talking and sharing on Pinterest, but Meredith Corp.'s Better Homes and Gardens created a contest to crank up user engagement a few notches. 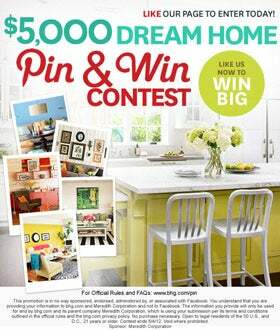 To complement its 62 boards on topics ranging from entertaining to garden design, the magazine started "Pin & Win," a contest that calls for users to curate a board called "My Better Homes and Gardens Dream Home" with interior and exterior images from BHG.com. 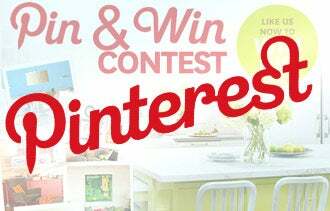 Better Homes and Gardens started a 'Pin & Win' contest. Editors will select 10 finalists, who will receive a $100 gift card and be featured on Better Homes and Garden's Pinterest, Facebook, Twitter and Google+ pages. The grand prize winner will receive an additional $4,000 prize. Running through early May, the contest so far has generated about 1,000 entrants. "We see this as a fantastic way to introduce new people to the brand and engage existing visitors more deeply with content around their passion points," says Janell Pittman, general manager of BHG.com. Currently, she says, referral traffic from Pinterest to BHG.com is greater than from the magazine's Facebook and Twitter pages combined. Additionally, the magazine is learning more about the people who follow its brand. "The editors have had fun seeing what consumers have picked" for the dream home board, Pittman says. "It's a great source of learning about who she is and what she likes."